Wera Kraftform 336 Stubby Slotted Screwdriver. Head slotted 5.5mm. 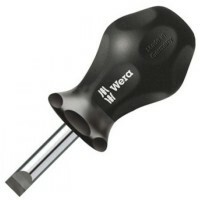 Head thickness..
Wera Kraftform Comfort Screwdriver Flared Slotted Features Head slotted 10mm. Blade..
Wera Kraftform 334 Screwdriver Slotted Features Head slotted 10mm flared. Head thic..
Wera Kraftform 334 Screwdriver Slotted Features Head slotted 5mm flared. Head thick..
Wera Kraftform 336 Stubby Slotted Screwdriver. Head slotted 4mm. Head thickness 0..
Stanley FatMax Screwdriver Parallel Slotted Tip Features Tip size 4.0mm. Blade leng..
Stanley FatMax Screwdriver Parallel Slotted Tip Features Tip size 3.0mm. Blade leng..
Wera Kraftform 336 Stubby Slotted Screwdriver. Head slotted 8mm. Head thickness 1..
Wera Kraftform 336 Stubby Slotted Screwdriver. Head slotted 6.5mm. Head thickness..
Wera Kraftform 334 Screwdriver Slotted Features Head slotted 6.5mm flared. 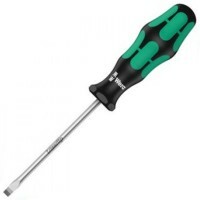 Head thi..
Wera Kraftform 336 Stubby Slotted Screwdriver. Head slotted 3.5mm. Head thickness..
Wera Kraftform 334 Screwdriver Slotted Features Head slotted 8mm flared. Head thick..